Game development can be a very time consuming process. Once upon a time a developer could crank out a new game every year. As time has gone on and technology advances further and further, gamers expect higher and higher quality from their games leading to even longer development times of up to 5 years. For a developer that creates a really popular franchise, there is an expectation that they will continue to make those games and release them in a reasonable amount of time. Sometimes a developer takes a hiatus from a franchise to do something else and plans to come back to it later. But how much later? How long will it take to get to it if you have another time consuming project to work on before you get to that? That’s kind of the problem I have some aspects of the industry right now. The human life span averages out in the 70's for both sexes with the upper limit being debatable, but mainly agreed upon to be the 90's(With some outliers in the 100's.). If a developer released one game every 10 years, you’d get 9 games, 10 if they released one the year you were born. But for 60-70 years of that you have an increasingly limited amount of time to play games due to ever mounting responsibilities and just general life stuff. If you have to wait 10 years to play the next game in your favorite series, you’ll be ten years older and might not even be able to play it. This is the part where you’re wondering what games I’m even talking about because most games have 3 year dev cycles. 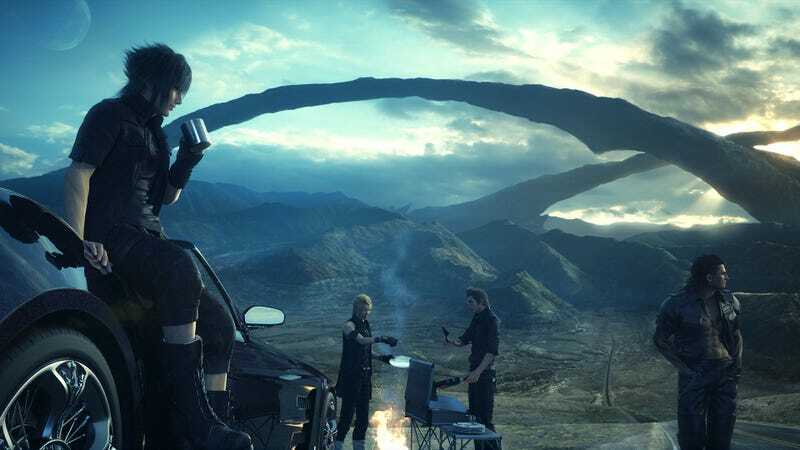 I used Final Fantasy XV as the poster child for this article because it took 10 years to release and it wasn’t even really the same game by the end of it. That’s the development process for you, but also a switch in directors and corporate changes that wanted to get a long delayed game out the door. I was in intermediate school(5th through 7th gtade.) when the game was announced as Final Fantasy Versus XIII, I am now 20 and have been out of high school for two years and 9 months, give or take a month, and luckily I was having trouble finding employment so I had the time to invest in Final Fantasy XV after waiting all that time for it, but I saw many people express how much they wanted to play this game that they had been waiting 10 years for, but couldn’t because their lives had changed so much in those 10 years. The most recent example is Persona 5. Many people who aren’t familiar with the series probably think this is just a niche franchise that’s only been around for like 5 years and just flying under the radar, but the last numbered Persona game came out 9 years ago in 2008. The reason that it took so long for Persona 5 to come to fruition is because the team behind the series worked on a game called Catherine in between which took time away from developing the next Persona game. Instead we got a director’s cut version of Persona 4 for Vita, two fighting games, a 3DS dungeon crawler, and a rhythm game for Vita. You could argue that these last 9 years have allowed Persona 5 to be the game that it is, the game that’s getting as much critical acclaim as Zelda: Breath of the Wild, but that’s 9 years that Persona fans had to wait, a span of time in which their lives probably changed a lot and obviously the developers behind it are now 9 years older and they aren’t getting any younger. A Persona 6 has not been confirmed as existing any time soon and I don’t recall if they’ve ever said the time to release will be shorter, but I have a bad feeling that it won’t be shorter. The series isn’t over, they haven’t said anything to that effect and the reviews and Japanese players haven’t said anything that suggests the end of the game puts an end to Persona or anything, so the expectation is that there will eventually be a Persona 6, just as a Final Fantasy XVI is inevitable, but when it will release is a mystery and because key players in Persona’s development are wrapped up in a new IP bodes ill for Persona 6's development schedule even more. And then of course there’s the Elder Scrolls series. Originally this was really all Bethesda worked on. Time to release between Morrowind and Oblivion was 3 or 4 years. Time to release between Oblivion and Skyrim was 5 years. Skyrim to whatever Elder Scrolls VI is? No idea because not only did it take Bethesda 4 years to make Fallout 4, not giving them time to make any serious progress on an Elder Scrolls VI, but they’ve also gone on record saying that they have two other games, new IP’s, on their list to make and release before Elder Scrolls VI enters the spotlight. We’re probably looking at a release in the 2020's sometime, probably 10+ years after Skyrim. I’ll be in my mid to late 20's by then and hopefully have my life sorted out, but that also means I won’t be able to no-life the game like I could now, I won’t get to enjoy it nearly as much if at all. For all I know my future wife could chuck my game systems in the trash, sell them in an impromptu yard sale without my knowledge because I’m out of town, or maybe my kids busted my systems and I don’t have the money to replace them in time. Time marches ever onward, never stopping, never going backwards, only forwards. I could die tomorrow and I’ll never have been able to see these series through to completion. Heck, if I really did die tomorrow I wouldn’t even get to play Persona 5 which releases next Tuesday. I’ll have been so close only to be denied the satisfaction of finally having this game I have waited so long to play. That’s depressing to me. If the series were officially ended, I would have no problem with a new entry appearing 10 years later, because I thought it was over. But knowing that there will be a new game, and knowing that it probably won’t be released for a significant chunk of my human lifespan, is just a sad thing to think about. If you’re going to start something, finish it before you move on to something else. Of course, then you have Valve who really don’t know what they want to be. At first they wanted to make games, and damn did they make some good games, but then they thought “Hey, lets make hardware instead and sell games through a PC distribution platform.” Then their releases ground to a halt and they’ve shown zero signs of making any new games in the last 5 years, content on improving the ones they already have. Supposedly they’re done with R&D and going back to making games, but who knows how long it’ll be before we see a new Left 4 Dead, Team Fortress, Portal, or, dare I say, Half-Life. Lots of Valve fans have probably moved on with their lives. And that goes for all of these fandoms. People can only hang around for so long before moving on. You can start fresh with new fans, but then you lose out on the community, on the passion of the old fans. The people who made you what you are, who made your series that best selling series of a generation, are no longer there.